This is a toy line I found out about thanks to @armyofthesix1six on Instagram. He posted some photos of them to his account and they immediately caught my eye. 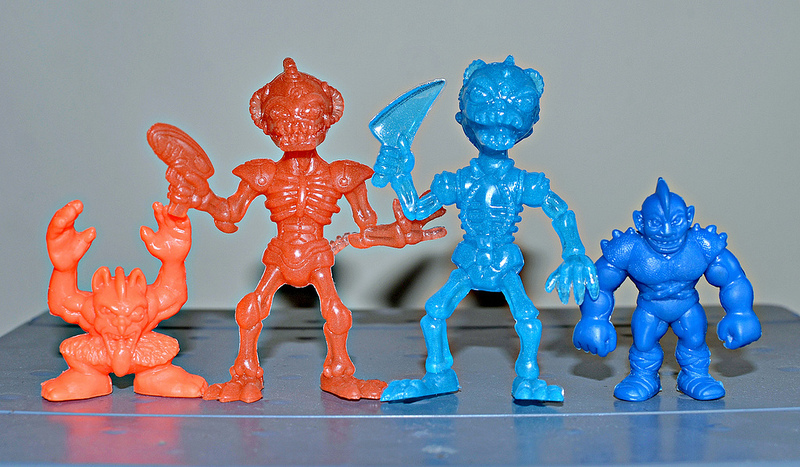 What exactly are these hunks of weirdo plastic goodness, you ask? 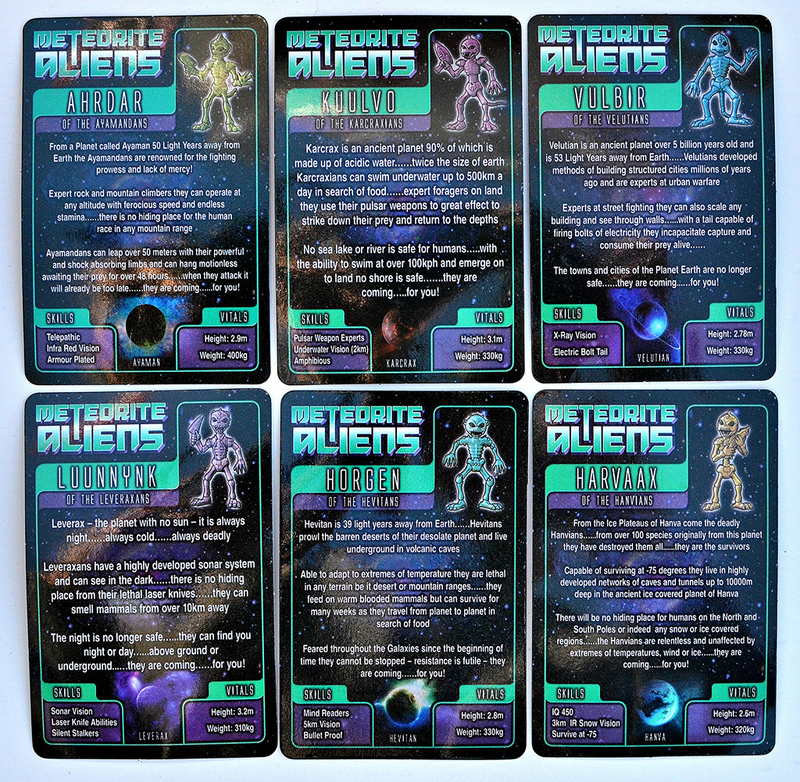 Meteorite Aliens! 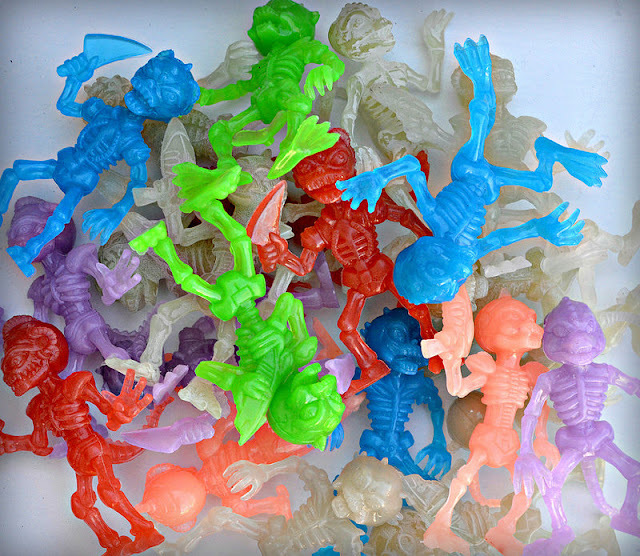 Blind-bagged monochromatic alien mini figures. The good news is that they are a currently-available release that can be purchased relatively cheaply. The bad news is they appear to be limited to the UK, so if you want to get a hold of some in other countries, you have to pay overseas shipping prices. I ordered some from gt-originalwarehouse.com, but they now appear to be out of stock there. However, another online store (where they still look to be in stock) is allaboutpartybags.co.uk. There's probably other vendors, too. I'm not sure. "They came by meteorite to target and eliminate the human race," says the packaging. 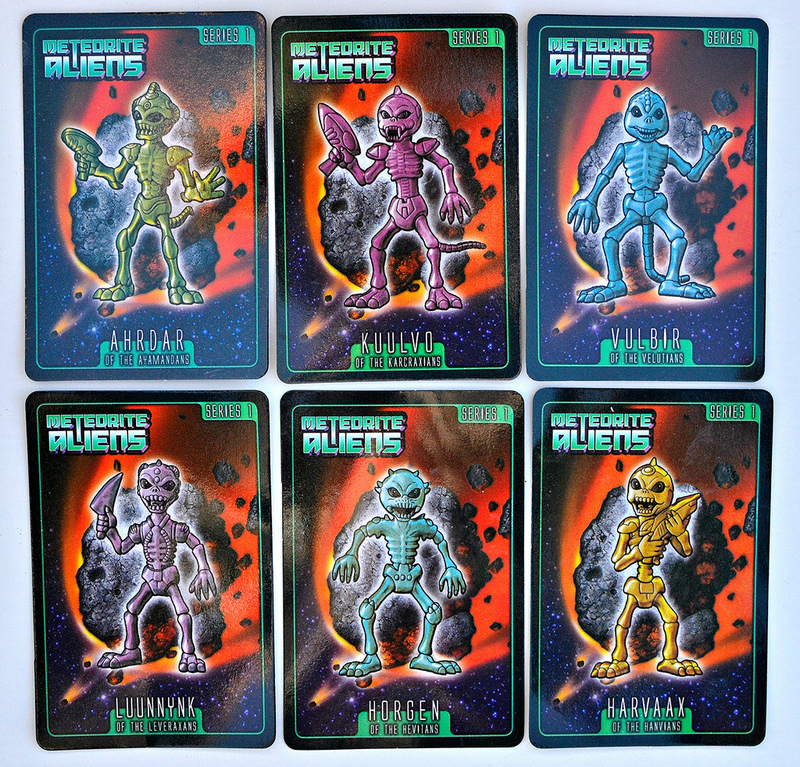 The Meteorite Aliens are six different races of alien baddies that are out for human flesh, apparently! 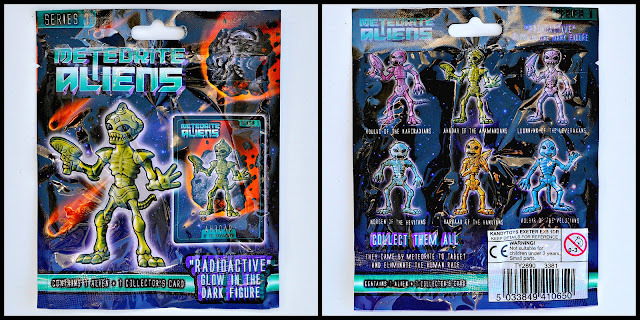 The figures come in blind bags so you can't tell what's inside each package -- one figure per package along with a character card featuring artwork and a bio for the corresponding alien. The figures seem to be the same ones previously available in activity sets that also used the name Meteorite Aliens. 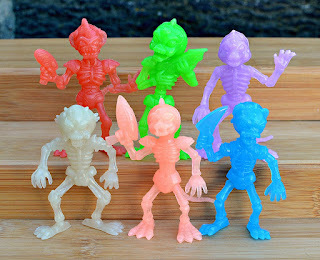 The idea with those is for kids to chip away at a "rock" substance to unearth the alien figures. There's no activity or game tied to these blind bag versions. Strangely, there's not a company logo or website on the packaging -- just the word "KandyToys" above the product code, which from a quick search appears to be a toy importer. So there's not a whole lot of background info about these to be found. As mentioned above, the Meteorite Aliens come one figure and one bio card per bag. There are six different sculpts to collect in six different glow-in-the-dark colors -- white, pink, red, purple, blue, and green. So, a master set consists of 36 figures. Based on the packages I got, it's hard to say if any colors are more or less common than others. I got the largest amount of figures in glow white, but overall I got a nice variety of all six colors. I think I got the fewest of the pink color. 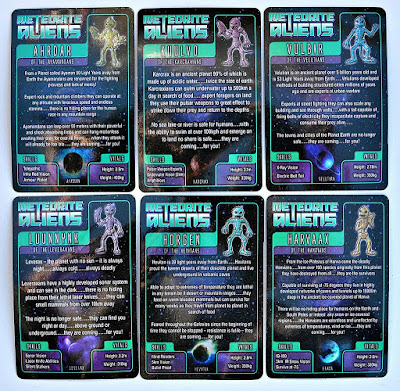 I like that each alien's card provides a detailed bio for its specific race, including its skills, vitals, and how specifically it goes about hunting down humans! Each race's bio ends with "They are coming...for you!," which is kind of funny. 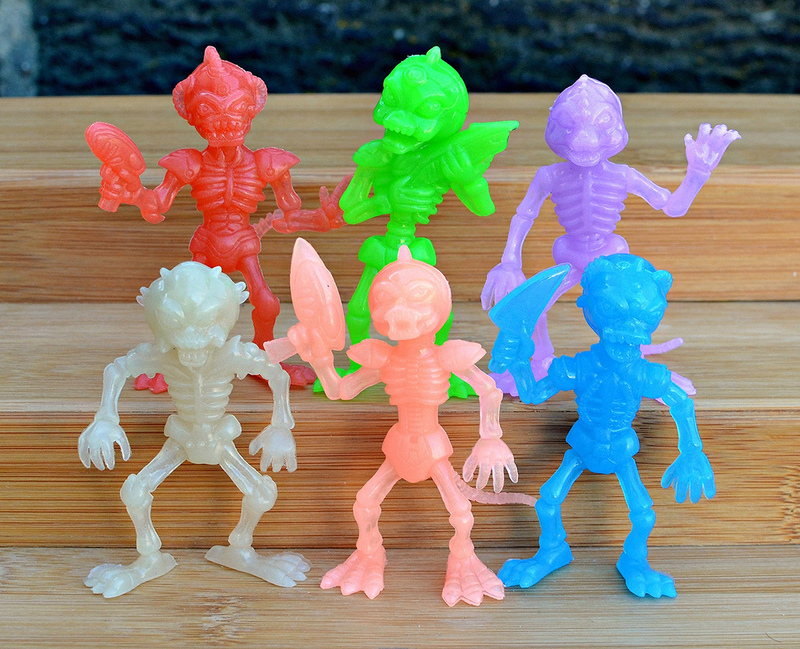 I like the fact that these little weirdos were designed to be scary, ugly and fierce, not cutesy or cartoonish like a lot of monster or alien-themed minis are these days. 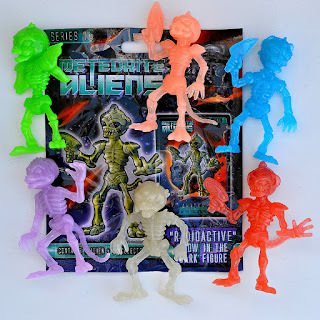 The Meteorite Aliens are sculpted very well, with each all six being gnarly, big-headed creatures with skeleton-like bodies. In addition to the sculpts having various poses and weapons, the races are differentiated with subtle physical features like different textures on their heads and the fact that some have tails and others don't. I love the personality infused into their faces -- they look like properly horrible little buggers out to wreak havoc. In this sense they give me a bit of a "Mars Attacks" vibe. 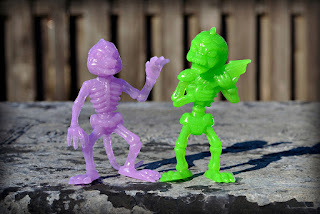 The biggest issue is that because of the aliens' skinny bodies and the soft plastic used, most of them come out of the packages misshapen and don't stand very well. Sticking them in hot water and then immediately into ice water helps straighten them out so they look better, but even after that some of them aren't able to stand properly. It could be problematic if you're someone who likes to display all your figures on a shelf. The figures are about 2.75 inches tall, so they are larger than some other little weirdos like Monster in My Pocket and MUSCLE, but I'd still consider them mini figures. I love these guys. 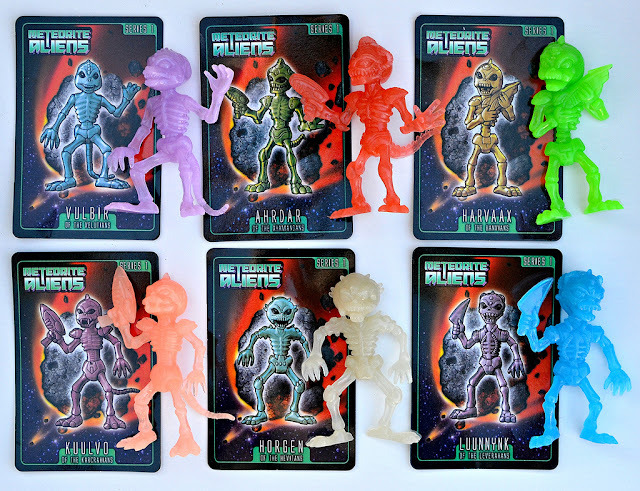 They really remind me of old school mini figures in pretty much every way -- design, material, packaging, etc. 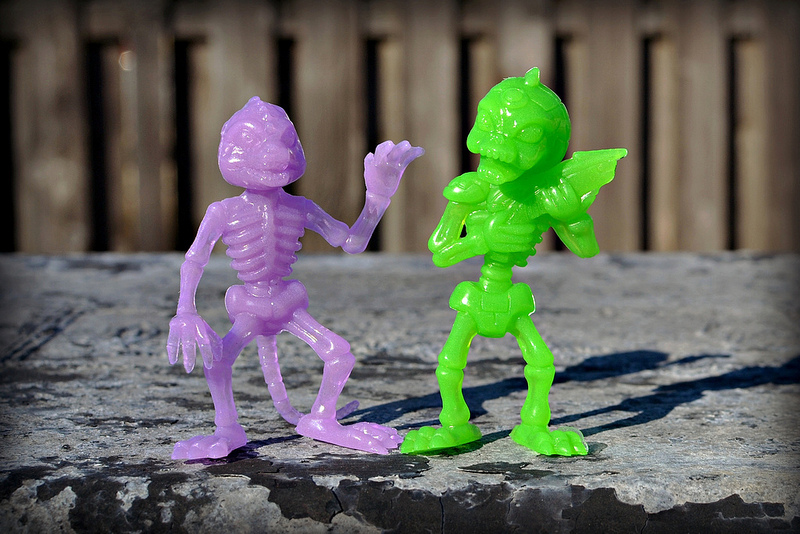 Between the nicely done sculpts and eye-catching glow-in-the-dark colors, they are really fun and appealing toys. And at roughly £0.50 each (about 60 cents in U.S. dollars), the price is certainly right, even if you have to pay more for overseas shipping. The packages say "Series 1," so maybe we'll see more of them turn up eventually (though I know better than to get my hopes up for another series of any toy line before I'm actually holding it in my hands). What about you? 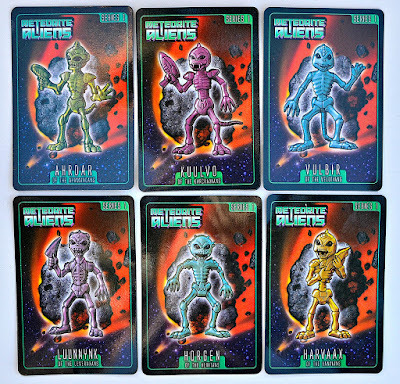 What's your take on the Meteorite Aliens? Great looking figures. Wish they had a US release.